This is the second post about specialized threat assessments. The first post explained what a specialized threat assessment is, how to gather the information needed and how to organize it. If you haven’t read the first post, follow this link. This post is going to focus on how we are going to use that information and expand on concepts from previous posts. We have identified the trending violent crime and assigned severity and probability ratings. We can’t plan for everything, so our next step is to eliminate any crime that has a low probability and severity rating. This should [hopefully] leave us with a relatively short list. This was the easy part of the assessment, we only had to gather and organize data. The hard part is finding what current tactics are being used. In order to find information about the current tactics you can check local law enforcement press releases, news reports (take these with a grain of salt), make a request for police reports or you may be able to even interview a detective in your local jurisdiction. Completing any threat assessment takes effort and it’s not always easy to complete. Like I said in part one, you can be as detailed or as general as you like. Before moving on, I would like to expand on some ideas from the Habits post. In that post, I talked about changing routes to and from the places we frequent. Let’s add on to that by examining the route in general. I want to be aware of what areas along my route that will slow or stop me. These are called choke points. Since this isn’t a war zone, I’m not worried about improvised explosives devices (IED) or an all out ambush, so I want to narrow down these areas even further. I want to identify areas that slow me down or stop me but also allow criminals to hide in plain sight. Criminals are [can be] smart, remember this is what they do for a living. I want to pay attention to choke points that have areas that allow people to stay for extended periods of time without drawing suspicion. For example, if someone is standing on a street corner for long periods of time, without reason, it’s going to draw attention. On the other hand, if there is a bus stop, stoop, coffee shop, park, or even panhandlers; they can stay for hours without drawing a second look (complacency tends to set in if we routinely see the same individuals or even different individuals in the same area). These are the types of choke points I want to be aware of on my routes. These areas allow criminals to sit, observe, plan and pick a soft target without anyone thinking anything odd about it. However, there are pros/cons of each of the example areas I mentioned, it will depend on the level of experience and training of the individual. I don’t want to get into the specifics of surveillance, that is for another post. Taking the previous paragraph into consideration, I want to look at my route and identify areas that have this criteria: crime with a high probability/severity rating and choke point(s) that easily hide criminals. Let’s examine this area. This is an area in New Orleans that I frequently travel. I have identified this area as a choke point with a mid-level probability for assault and motor vehicle theft. This is an area that also allows potential criminals to congregate. This is a four way stop light with each street being one way. There are gas stations across from each other on two corners and an auto part store across from a small park and a coffee shop right behind it. Also there are two bus stops catty-corner. 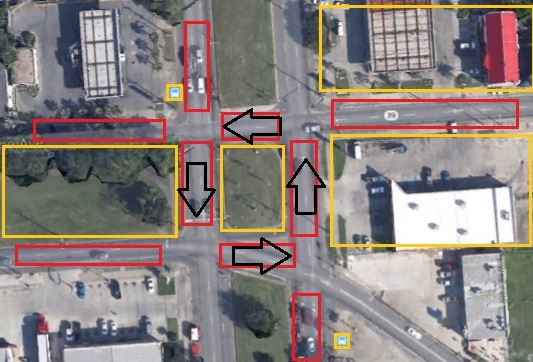 In the picture below I have used yellow boxes for the areas where people typically congregate and red boxes for the areas that cause slowing or stopping due to lights, traffic, or construction (choke points). The black arrows show the flow of traffic. This is now where we start to make our plans using all the information we have gathered. I can’t tell you what your plan will consist of. You will need to take all the information into account and use the concepts from other posts to help you, such as, your findings from your automatic scan. Here are some questions to ask yourself: Where are my closest exits? Where is the closest police station/hospital/fire station and how do I get there? These are important for safe havens and also response times in case you are injured or need assistance. What are my alternate routes? Which roads run north/south/east/west? Some areas have a grid that is laid out with streets running east/west and avenues running north/south. These are things that you want to commit to memory. What tactics are currently being used? What tools/training do I need/have that will help me? For example, tools like firearms, first aid/trauma kits, cell phone pre-programed with emergency contacts/emergency services on speed dial/voice command or training like firearms, self defense, first aid/medical first responder, etc. Having all this information allows you to make the best plan possible. At the end of the Forgotten Aspects of Situational Awareness post, I mentioned coming up with scenarios and how you would respond. This information allows you to be realistic on what type of threats will happen, how they will happen and where. Take all this into consideration when creating a plan and practice it, even it’s just a mental exercise. In the end, you can have the best plan in the world but it comes down to your situational awareness. If you don’t see the Pre-Attack indicators, your plan is likely to fail. However, if you succeed in identifying the indicators you should be able to execute your plan without freezing or panicking. This entry was posted on Saturday, September 13th, 2014 at 1:29 pm	and tagged with Martial Arts, New Orleans, personal protection, Risk Assessment, Self Defense, Threat Assessment and posted in Violence and Prevention. You can follow any responses to this entry through the RSS 2.0 feed.